When the elderly dance troupe, Hip Op-eration first came to our attention we thought the story was a ‘no brainer’. We began filming in late December 2012 in order to spend time on the island, getting to know the characters and their stories and familiarising them with the crew and camera. Principal photography began in late March 2013. Throughout we worked closely with their manager, Billie Jordan, to coordinate shoots and events and organise time with individual characters. The crew spent an average of four to five days on Waiheke Island every month and the troupe quickly forgot the camera. Initially it proved difficult to find a strong story thread that would carry us to Las Vegas with any one key character. So the documentary became more of an ensemble piece, linking stories from each character’s past with the physical hip hop journey. But the story took an unexpected twist with the introduction of Street Dance New Zealand and DZIAH and KRASH dance troupes. 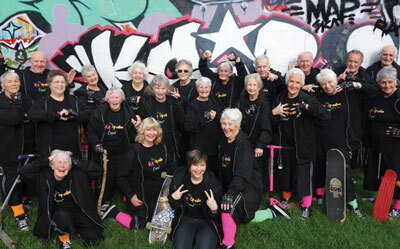 The young hip hoppers took Hip Op-eration to their hearts and the relationship between the elderly Waiheke troupe and the young Maori and Pacific Island crews became an inspirational and integral part of the film. By the end of June we were getting anxious. The World Hip Hop Championships were due to take place in early August 2013 and by mid May the troupe had performed to a standing ovation at the New Zealand Nationals. As Billie had still not heard from the Championships, time was running out. In desperation the producer rang the World Champs, put some pressure on the organisers to make a decision and arranged for the crew to be there ‘co-incidentally’ when Billie received the ‘surprise’ call. The film crew travelled with the troupe at all times and stayed at the same resort. Filming finished in Las Vegas in mid August and after a three month hiatus waiting for our editor to become free we then went into an extended six months of post-production at RPM Pictures: a total of twenty months from start to finish. A common question we get is ‘Did anyone die?’ The answer is no. In fact they all had a remarkable new lease of life and continue to hip hop their iridescent socks off. From the outset the production risked potentially huge costs in music royalties so, as a fairly low budget documentary we had to find ways to contain this. The pumping hip hop sound tracks are unpublished tracks by local hip hop artists PHD HIP HOP and SuperVillains RMC. Supervillains also provided tracks for the recently released New Zealand feature film Dark Horse. The cover track for Bubblegum was provided by young Kiwi artists, Monax and Possum. The singers are Kingdon Chapple-Wilson (Kings) and Hannah Leigh. All appear in the film.